Sun Tea is one of the most refreshing and fun spring and summer drinks to make. Many people ask how to make sun tea - that is a difficult question. There are so many different ways to make sun tea, it really depends personal preferences, the sunlight intensity and temprature of the climate that you live in and the suntea jar that you have. The first thing you need to do is make sure that you have a good sun tea jar. 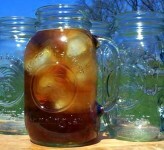 Some of the less expensive sun tea jars are plastic, but most people prefer a glass sun tea jar. It is worth spending a bit more to by a glass jar because your glass sun tea jar will last longer and most importantly, your sun tea will probably taste better. Glass jars are typically easier to sanitize and dishwasher friendly. Once you have the sun tea jar or glass that you are going to make your sun tea with, you need to select the tea bags that will be used. Generic tea bags from major manufacturers can found at your grocery store. Also, there are specialty tea stores that have intersting blends and flavors - consider trying several different types of tea before you pick a favorite - it can be a lot of fun. Many people like to add a fresh lemon as well. The preperation of your sun tea jar is very important. You should be sure that you read recomedations for sanitizing your jar or glass. Also, take note of the recomended tempratures to brew your sun tea at. Last but not least, you will want to set a timer or alarm for yourself once you decide how long you want your sun tea to brew for. Understanding the flavor rewards and potential risks with different brewing times will help you decide what is best for you.